1) Quinoa is a complete protein, which means your body gets all the essential amino-acids it needs to build things like antibodies, enzymes, neurotransmitters, etc. Many people think we must eat meat or chicken in order to get enough protein in our diet, which is simply not true. 2) Quinoa is great for energy and wound healing. In fact, historically quinoa was eaten by the Inca warriors to boost stamina and quicken recovery time. 3) The saying “you become what you eat” is true regarding Quinoa as well. It is a high endurance food, and when we eat lively foods eventually we become like that food. If you experience energy crashes during the day, notice what you have on your plate next time you eat. Are the foods natural, alive and good quality? If not, then this might be the reason behind your energy crashes. If you get used to eating quinoa your energy level will go up for good! 4) Quinoa is GLUTEN FREE! The less wheat in your diet the smaller tuches you’ll have, do I need to add more? 5) Quinoa will help you to get rid of toxins. 6) Quinoa has a high dietary fibre, which helps you poop! We need tons of soluble fibre in our diets so that our bowel movements are regular. 7) Quinoa is super healthy for baby! Add it to their soups, fruit, veggies, milk or formula. It is a great first food, instead of processed white rice, barley or oats. If you have bloating issues soak your quinoa 2-4 hours prior to cooking it and make sure to wash it thoroughly before you cook it. Soaking makes the quinoa more digestible and easier to break down in your stomach. In my household we often have cooked quinoa in the fridge. It is a lifesaver for me when I simply don’t have the time to make something else. I make cakes, veggie burgers, pancakes, and even sushi with this amazing seed! Last week I shared a recipe for quinoa sushi on my blog and it was a big hit, so Jane asked me to share it with you ladies as well. 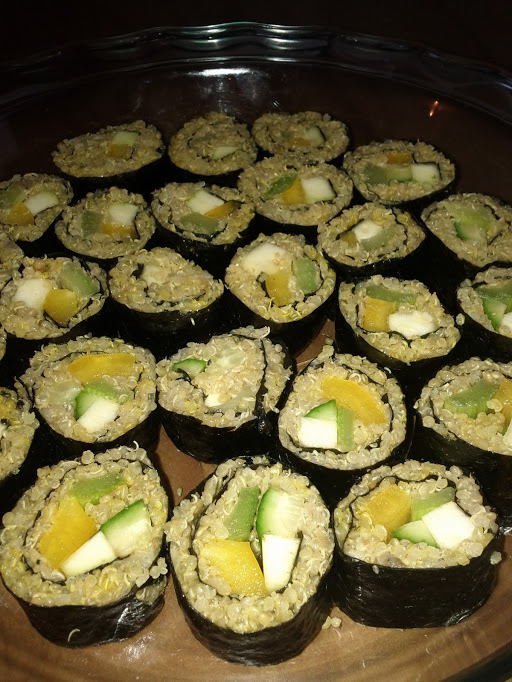 I made these delicious quinoa sushi last week and it was a big hit in our household. Kids absolutely loved it, they didn’t even notice that I put quinoa instead of white sushi rice. * You can put whatever you or your kids like! This is where you hide those veggies if your kids refuse to eat them raw, so be creative! Spread the quinoa on the sushi wrap, put veggies on the edge of the wrap and roll. The process is exactly the same as you make sushi, just substitute rice with quinoa. 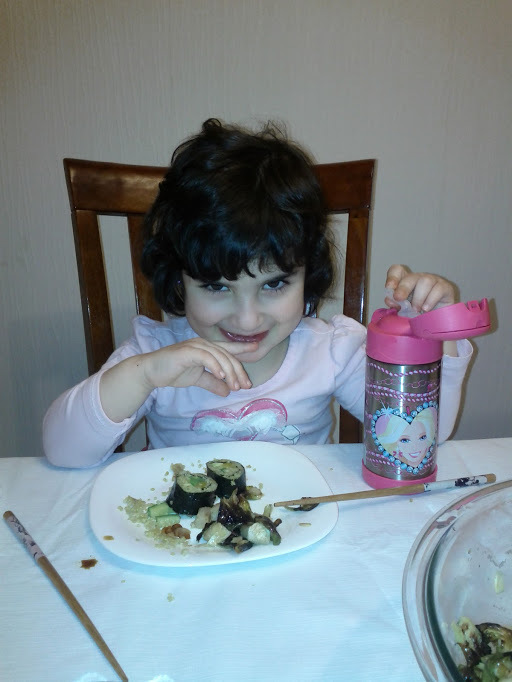 Here is a photo of my daughter, Sheli, eating quinoa sushi, so cute!